Send in archaeological stories or contributuions you would like to share with the societies members send details to nmaidment@aol.com. Look forward to reading and passing them on. Below is a series of my notes along with quotes from the author Sir Walter Scott, inspired by the first day of the dig at Portkil cave. Those there will remember the look on my face when I retrieved a jam pot from the top surface of the cave. I had been told that one of the series of caves had been called Effies Cave. Previously the linkage has been discounted, but that afternoon with the sun glinting through the trees and the lush green undergrowth I felt I had to go and discover more about Effie. 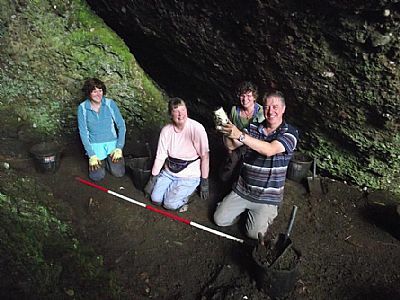 Never did I think it would lead me to read "The Heart of Midlothian".This link takes you through my speculation relating to Effies and the cave. Why would you want to distance yourself from such a great tale? see details below range of colours and sizes.